Apex Scaffolding have many years experience of erecting temporary roofing scaffolding, from a small scale solution to cover a bungalow during a winter loft conversion to a virtual warehouse to house a large sailing yacht during construction. Temporary roofing is an excellent solution for the construction industry on both new builds and refurbishment. Protection over the works area means that minimum time is lost due to bad weather, allowing for faster project completion and subsequent costs savings. 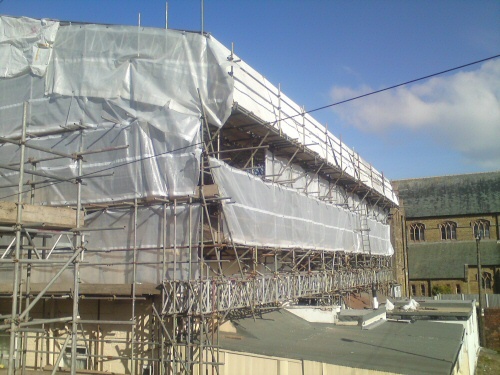 Property Re-roofing / Refurbishment - An access scaffold with a high level weather proof covering keeps new works and the existing structure dry whilst work is completed. Protection of Fire Damaged Buildings - During structural repairs and / or where the roof has been totally or partially destroyed. Virtual Warehousing / Buildings - Using a temporary roof and sheeting over scaffolding to create a temporary waterproof indoor work area. Covered Access Roads / Routes - Next to and around construction sites with netting placed overhead to protect against falling debris from works above. To enquire about our temporary roofs and roofing, please email or give us a call.